At Right on the Walls you can find a huge selection of vinyl wall art and vinyl decals. This family-owned company designs and manufactures every piece per your specifications. I love family-owned and personal businesses because it means personal interaction! The thought of putting vinyl on your walls or windows may be a little intimidating to you but I want to reassure you how incredibly easy it is to apply... and to remove! 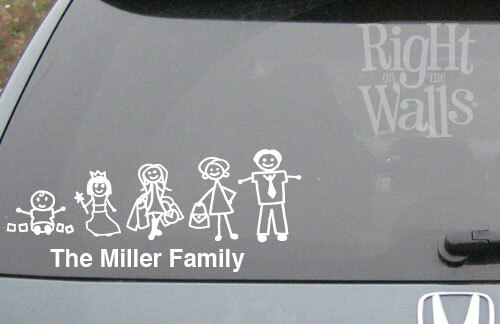 You can get those cute sticky family decals for your car HERE! For my review I selected a MYSTERY PACK from the Bargain Bin. I wanted to see what would be included in the Mystery Pack (I chose Girl Pack) for the price which is $22 per pack. I was definitely NOT disappointed! I didn't really know what to expect. Because it was a mystery I didn't get to choose colors or phrases. I got a completely random pack based on the theme. I got 6 different pieces in varying sizes such as "It's Not Easy Being a Princess... But hey... if the Crown Fits!!!" as seen toward the end of THIS page and the "Sweet Dreams * Sleep Tight * We Love You * Good Night" as seen toward the end of THIS page. If you're hesitant about getting a mystery pack I highly recommend it! Everything we got was something useful and super cute. As for applying the vinyl it was so so so simple. I followed the easy-to-follow instructions, peeled off the backing and carefully applied it to the wall. The result was a beautiful painted mural on the wall without the mess or time wasted. It took me less than five minutes from start to finish and my cleanup was a breeze. I just threw the leftover paper in the recycle bin! One lucky reader is going to win an electronic gift card for $40 from Right on the Walls! AND visit Right on the Walls, browse around, and come back here to tell me about what you would choose if you were to win! I just saw a growth chart that I love! I'm a follower and I think I would get the solar system decor kit. I LOVE the bamboo artwork! It would be a tough time choosing, that's for sure! Thanks for the great giveaway! I'm a Girly Girl Giveaways fan on Facebook. I follow you and if I won I would choose the Headboard Floral Design I.
I like the birch trees with the custom carved heart - and I follow your blog! -I love the Custom Family Kitchen With Year! I follow with gfc (psychdog) and love the wall clocks that are right on the wall. I had no idea you could do that. I especially like the big numbers one. I love the Big Numbers Clock! Following you on GFC and I like the Merry Christmas decal! I follow you on GFC and would love to get the Fleur Clock!!!! I would love to get the "Because I Have A Brother I Always Have A Friend" vinyl.